Tired of conventional shapes? Craving for something really bizarre and one of a kind? Birdwatcher is exactly what suits right for you! 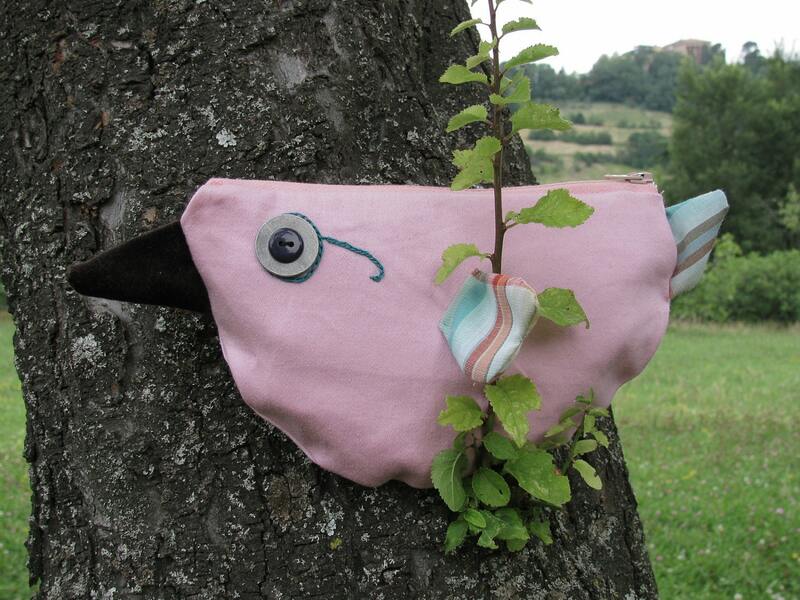 This novelty cartoonian-bird-shaped pouch is made in plain pink cotton, with wings and tail in a daring chequered light cloth and a proud beak in deep brown velvet. His watchful eyes and funny glasses have been created with a comic-strip-like blueish green embroidery and two overlapping metal and plastic button appliqués. A handy zip closure is placed on the upper part of the half-moon body and a pink synthetic satin lining puts a finishing touch to the inside part too. Wear it as a pouch, make it the perfect case for your mp3 player, a funny purse for your savings: be creative, be unconventional, wear Birdwatcher, the winged and four-eyed novelty creation by Lantern Bug! Uhm...Know what? Lantern Bug's still not fully satisfied...is there any further surprise...? Stay stitched and you'll know!